In June, hatches start to thin out. We still see a fair number of Yellow Sallies and a smattering of caddis and mayflies, but the heavier, attention getting hatches of spring have mostly come to an end. But when summer eases its way into the mountains, trout turn their attention to terrestrials, and so should you. We’ll talk about several varieties of terrestrials over the coming months but we’ll start with the granddaddy of all mountain terrestrials: the Green Weenie. 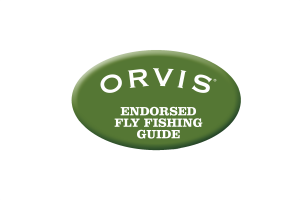 If you’ve spent much time around Smoky Mountain fly shops or researched recommended fly patterns for the area, you’ve no doubt run across this fly. Chances are you’ve fished one at some point. While incredibly simplistic, this is one of the most popular and most productive fly patterns in the Smoky Mountains. My good friend Brian Courtney ties this fly for Little River Outfitters in Townsend. To date, he’s tied them 25,000! There is a little bit of debate about what the fly actually imitates. Many claim it imitates a caddis pupa. 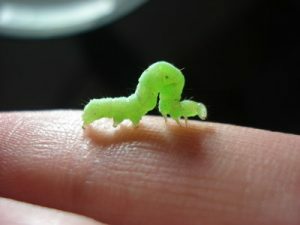 Most believe it imitates a green inchworm. Since I am including it in a conversation about terrestrials (land based insects), you can guess which side of the debate I fall. 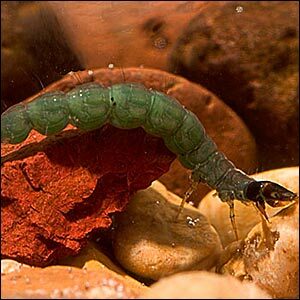 A lot of those little green inchworms end up in the water and trout love them! But the truth is, many caddis pupae look very similar to green inchworms. The Green Weenie is a pretty effective imitation for both. However, one of the reasons I tend to put it more in the terrestrial family is that it works best in terrestrial season. While you can certainly catch fish on it other times of the year, it always seems to be at its best from mid May through early October. The Green Weenie is different than most terrestrials like hoppers, beetles, and ants. You typically fish it like a nymph rather than on the surface. There are other floating fly patterns intended to imitate inchworms but I don’t find them nearly as effective. Inchworms are poor swimmers and once they hit the water, it’s not long before they are submerged. So mostly I tie my Green Weenies to sink, and fish them on a dead drift. But I do tie a number of variations for different water types and situations. When the stream is running fuller or when I’m fishing deeper pools and runs, I tend to fish more heavily weighted patterns. These are sometimes tied with a bead head or with several turns of lead wire under the body. You can use an indicator or straight-line tactics. In these situations, I often fish the Green Weenie in tandem with a second fly. One of my favorite combinations is a Green Weenie for the top nymph and a smaller, more subdued nymph, like a Pheasant Tail, about 15” below it. Trout often take the Green Weenie. I believe just as often, its bright color gets attention and trout take the more subdued fly. When nymphing shallower runs or pockets, I’ll often replaced the weighted trailer nymph with an un-weighted nymph or soft hackle pattern. Another favorite technique for fishing shallow runs and pockets is to put the Green Weenie off the back of a dry fly. In these instances, I prefer an un-weighted Green Weenie. The weight of the hook is enough to get it down in this kind of water and the dry fly floats better and longer in choppy currents without the extra weight. I do sometimes like to add a glass bead to the fly for these occasions. 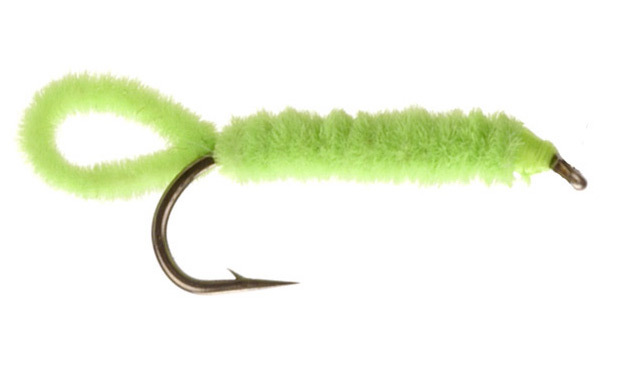 I most often fish this fly in a bright lime green to chartreuse color. Drab olive and insect green shades do well, too. Others have reported a lot of success with white, beige, and tan colors. And for whatever reason, pink seems to work well. You will sometimes see the pink version referred to as a Barbie Bug. Regardless of color, I tend to fish them in sizes #10 through #14. The smaller sizes, sometimes down to a #16, are reserved mostly late summer and early fall when the water is lower.